Here we are, amidst the holiday season and we are faced with a familiar dilemma: How do I avoid the perils of overeating during the holidays? If your family is anything like mine, the enormous amount of food served during holiday gatherings can rival that of restaurant-style buffets. It is inevitable to feel tempted by the aroma of the mass amounts of tantalizing foods. However, even amidst the bliss of the festivities, there lies the potential negative impact of portion distortion. Overeating during the holidays can put a heavy stress on your health and its impact can accumulate over time. It is important to willfully control the amount of food you consume during the holidays to prevent stress on the body and to avoid potential weight gain. If we can enjoy our foods in healthy portions, then we can prevent the effects that come with overeating. This in turn can benefit us toward a healthy head start for the exciting new year. 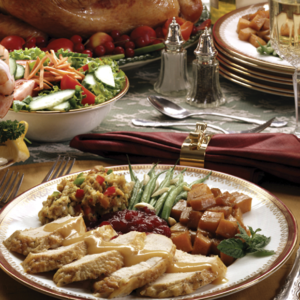 Over-consuming food during the holidays can be difficult on your body. Food is meant to be spread throughout the day to provide the nourishment your body needs to thrive. Overdosing on too much food, especially one that is devoid of nutrition and abundant in calories, can cause negative effects on your health and well-being. These effects include blood sugar imbalances, sluggish digestion, malabsorption of nutrients and weight gain. As a result, you may feel weak, spacey and irritable from the caloric assault on your body. Excessive food intake causes your body’s hormone and metabolism functions to kick into overdrive to process all the food you have consumed. This ultimately leads to processing and storing the food as fat, rather than using smaller portions of food for energy. The excessive food is a stress on the body, which the body will then react and adapt to. That reaction ultimately is to pack on those holiday pounds that we so often dread. Research has long indicated a relationship between stress and overeating. During the holiday season, we may potentially experience stress involved with holiday shopping, attending many gatherings or planning your schedule to meet all the demands. Remember that these feelings of stress can trigger cravings for foods that can contribute to overeating during the holidays. Practicing stress management techniques can restore balance to your mind and body which can aid in the prevention of overeating. Eat small before you go. This tip is especially helpful when you know you will be tempted by lots of unhealthy food choices. By nourishing your body before you are exposed to an abundance of food, you lessen your chances of overindulging. A healthy nutritional shake or some fruit and veggies, before you attend your event, could be all you need to prevent overeating. Select healthy options first. When filling your plate, serve yourself the healthiest options first, then build your plate from there. Dive in for salads, soups and appetizers that look appealing to you before you go for the heavy foods and sweets. Remember the palm of your hand is a good indication of a serving of protein. Selecting high-fiber foods like vegetables, fruits, beans and whole grains can keep you feeling full and also energized. Don’t forget to chew. Many of us ignore this fundamental rule of digestion. Digestion begins in the mouth, which is assisted by the enzyme amylase. Chewing your food properly will aid digestion and give your brain time to register you’re full before you overeat. Eat slowly and take time to enjoy your food within the comfort of your holiday gathering. Make time for exercise. Although exercise is not purely a method to control portion size, it is an effective component to stimulate metabolism during the holiday season. Overeating combined with lack of exercise are the two major culprits for excessive weight gain during the holidays. Conversely, portion control with nutritious foods combined with regular exercise can ensure you will survive the holidays without the excess holiday pounds. So remember, even during the beautiful holiday season the same laws of food metabolism still apply. I encourage you to utilize the power within you to make wise food choices to ensure you have a happy and healthy holiday season.